For Team Nika, it was a classic tale of 'pulling victory from the jaws of defeat' after what Russian skipper Vladimir Prosikhin described as his worst match race day ever yesterday and beginning today with one of his worst fleet racing starts: "We rounded the first upwind mark second last and it seemed to be going like yesterday - we had this depressing feeling. But finally we picked up - especially downwind - it became a bit easier and when it is easier it is encouraging, you pass a couple of boats, you feel like you are a better sailor, so you are more confident, more focussed and the team started working together. And finally we finished fifth." From there Team Nika went on to win the second and third of today's three races. But both were hard fought, come-from-behind affairs. In Marstrand, Team Nika is sailing with Match Racing, Etchells and Melges 20 World Champion, American Bill Hardesty. This is Hardesty's first occasion racing the RC44 and he is impressed: "They are great boats, with lots of power and good balance and they can really get going, but they can catch you off. And the class is nice. Having the umpires out there really helps." 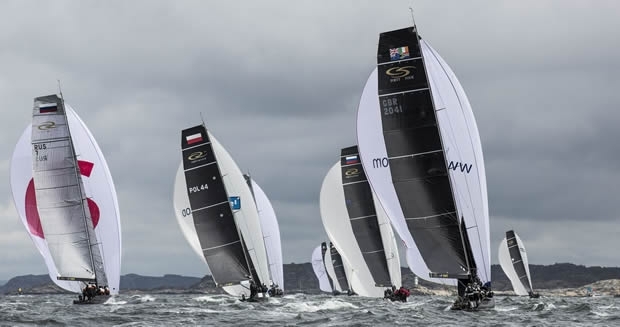 The other star performer of the day was the RC44 Marstrand Cup's host Artemis Racing. Torbjörn Törnqvist's team won the first race after the bold call was made to go right off the line, a move that paid handsomely. "Then it was really simple," admitted Törnqvist. "It is easy when you are on top and you can control the fleet. It is great to be here in Sweden and do well. This is the first day, of course, but it is nice. It was a good day, the crew worked well in a calm way in terms of boat handling and tactically." Let down by a fifth in the second race, Artemis Racing started well and worked hard to gain the lead on the first beat of the day's third and final race only to lose to Team Nika. "It was a much better day - we enjoyed it," said Artemis Racing tactician Iain Percy, who heads Törnqvist's Swedish America's Cup challenge. "It was quite a cloud-driven day. Everyone did a good job and Torbjörn was driving the boat well. It was a nice day out." "It was pretty shifty conditions, a tricky race track, but it was ideal for these boats with a few nice surfing waves downwind," recounted Charisma's tactician, Ray Davies. "The teams that sailed well as a group came out on top today - crew work was really important, working the boat downwind, dealing with the waves and the different modes you had to sail from one gybe to the other. There were some nice gains to be made downwind." Matters might have been different had Charisma not picked up a penalty in the final race for tacking too close to another competitor. "That dropped us back into about sixth and then we got back to fourth," recounted Davies. "Nico [Poons] is doing well. In these tricky conditions at times with the waves, you have to be very precise with the helming and he is doing a really good job with it."